I mentioned before that I love drinking tea and I’ve tried thousands of different types. I even considered growing my own after witnessing a farmer who grew tea indoors in Japan, but I did decide against that eventually. I do still love drinking it, though, and I recently decided I wanted an area in my garden specifically for drinking tea. I thought a gazebo would be perfect for that, so I had one installed. I write a lot about indoor gardening, because that is where you generally use houseplants, but this tea gazebo had to go in my outdoor garden. I did try to think of how I could make my indoor garden especially pleasant for drinking tea, but nothing I came up with would beat the outdoor variety. If you’ve ever been in a gazebo, you know exactly what I mean. They are wonderful no matter the weather. If it’s sunny, you get to sit out in the gazebo and enjoy the sun, while being under the shade of the roof. This is wonderful on a late summer afternoon. Some of my favorite memories are enjoying the late summer sun while sipping on a nice jasmine tea in my gazebo. Even when it’s raining, a gazebo is wonderful. You are under a roof so you don’t get wet. Of course, if the rain is going sideways this changes. But I love sitting in the gazebo and watching a nice spring shower or late summer thunderstorm. Thunderstorms are my favorite. There’s nothing like having a warm cup of tea while all around you the cold rain falls and the lightning strikes. In the winter I generally enjoy tea indoors, because it is a lot of work to get all bundled up. This year, though, I think I’m going to go out to my gazebo a few times. Yes, it’s a pain to get bundled up like that to stay warm, but I think it will be worth it. Having that warm tea out in the snow in my gazebo sounds wonderful. I’m sure I’ll only do it once, in the end. But who knows, maybe will become a daily thing. And obviously in spring, it is lovely to sit out there and enjoy the first warm days of the year. And later you get all the rainstorms and also all the flowers. There is nothing like sitting in your gazebo and having a cup of tea while looking at beautiful spring flowers. 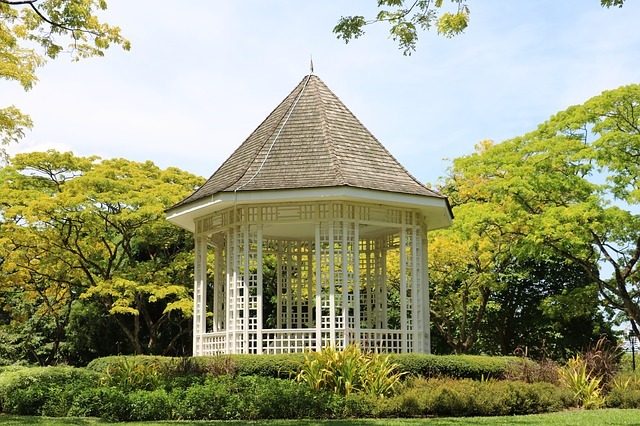 You could certainly make a gazebo for your garden yourself, but I hired a contractor. I just don’t have the time or the talent to build one. I’m a gardener. I’m good at growing houseplants, be they outdoor or indoor plants. I’m not good at building things out of wood. I am, however, good at sitting in those things once they’ve been built. I’m great at making a hot cup of tea and sipping it in that gazebo that someone else built. I am great at sitting there for 30 minutes to an hour and just relaxing and enjoying the beautiful views of my garden. It is truly one of the great pleasures in my life at the moment.